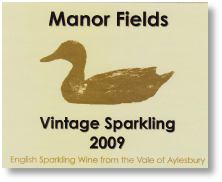 Manor Fields wine started on 12 July 2003. They were discussing what to do with their fields. Up until then, the local farmer had used the fields to graze sheep, and take the hay, but he had had such difficulty with the last flock being spooked by walkers with their dogs on the footpath, that he decided it wasn't worth the effort for only twenty sheep. So there Nigel and Ina were enjoying the hottest summer for ages with a hectare of land going to waste, when Ina says "Why don't you plant a vineyard?". 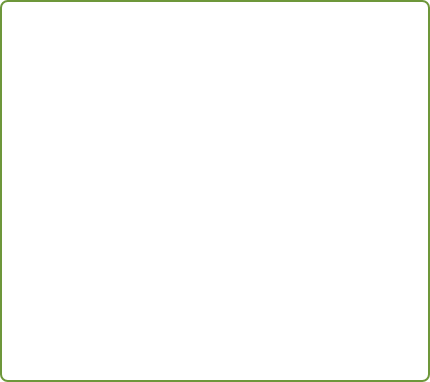 The intention was to make a fine quality sparkling wine, on a commercial basis, not too dissimilar to Champagne. There are several successful English vineyards that are already in this market, but it is still expanding. Being a hundred miles north of the South Downs there is a slight difference in climate (less rain and slightly wider range of temperatures), but they were hopeful that the micro climate created within the vineyard would make it a success. As sparkling wine takes a long time to come to fruition, they have also planted two 'modern' varieties: Bacchus and Madeleine Angevine. These produce wines more in the French style than those grown in England in the past. Bacchus makes a fruity off dry white wine rather like those of the Loire using Chenin Blnce e.g. Vouvray. Madeleine Angevine is crisper, more like Muscadet. The vines were planted in 2004 and first harvested in 2009. 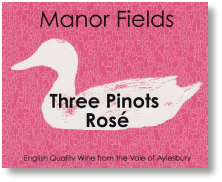 Manor Fields Vineyard now produce wines to perfection and THREE PINOT is a blend of Pinot Noir, Pinot Meunier and Pinot Gris which give a dry, elegant wine. This is fresh to the pallet with a quality good enough for enjoying on its own, or is excellent to drink with a meal. The vines were planted in 2004 and first harvested in 2009. We consider VINTAGE SPARKING WINE to be better than the very much more expensive French Champagne. A great wine for celebrations, or just sipping and enjoying on warm summer days. This wine has a wonderful bouquet, is full of flavour, crisp and clean with a fruity aftertaste.